Interior seams fully finished for durability.Soft mesh won't damage delicate fabrics. BAGAIL Packing cubes help you pack like items together. One cube for your bottoms, one for tops, another for underwear, etc. You can choose to further organize according to cube size, or even by choosing a specific color to signify which cube holds which belongings.Be creative and organize things the way you love. Find Your Things In A Flash. 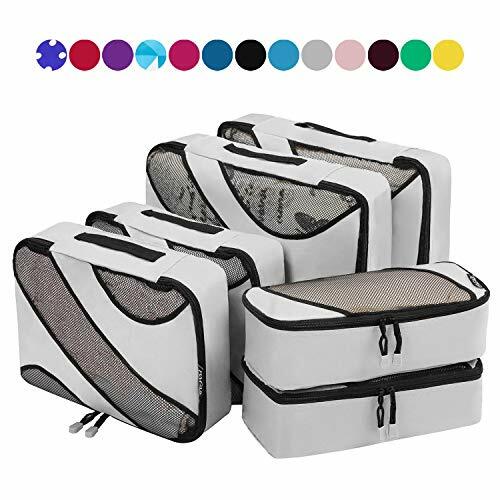 When using packing cubes, you can pull that one specific cube out of your bag to get exactly what you need instead of flipping through piles of clothing in a suitcase. All cubes have a mesh panel so you can see what's inside each one.